Here’s a fact that not many people know about me… It’s one of my ‘super powers’. I’m really great at opening jars. It may not seem a big deal, but trust me, it totally comes in handy. So how did I develop my super strength? It was something I figured out during my very first job in a winery. Now making wine is awesome fun but it’s also really physical. There’s lots of pumping, shoveling, lifting barrels and climbing. Coming from the corporate world this was a struggle for me. Plus being the only girl in the winery. It was tough. One day I was struggling to disconnect a hose fitting from a tank. My hands were aching. There was a lot of swearing. It wasn’t pretty. Then one of the more experienced guys came over to help. He showed me that if I lifted the hose to take the pressure off the fitting it was easy to loosen the screw. Not long after, I was in my kitchen struggling to open a jar of tomato pasta sauce. It wouldn’t budge. There wasn’t any one around with muscles I could borrow. Then it occurred to me… The lid was under pressure (or really a vacuum). What if I released the pressure? I grabbed a butter knife, jammed it under the side of the lid. When I hear that satisfying ‘pop’ of the lid being released I tried again. The lid twisted almost effortlessly. So there you have it. My ‘secret’ to opening tricky jars. What about that half full jar of honey or jam where the lid is literally ‘stuck’ on? Place some boiling water in a bowl… about an inch (2.5cm) deep. Upend the offending jar and leave it lid down in the water for a few minutes. Then remove the jar from the water and using a dry tea towel or cloth carefully twist off the lid. Done. Although if it’s still stuck leave it a few more minutes in more boiling water. At the end of last Summer I was heavily into roasting eggplant, zucchini and capsicum (bell peppers). This simple combo of eggplant and spicy sausage was one of my favourites! 2. Chop eggplant into 2cm (1in) cubes. Halve tomatoes if large and thickly slice chorizo. 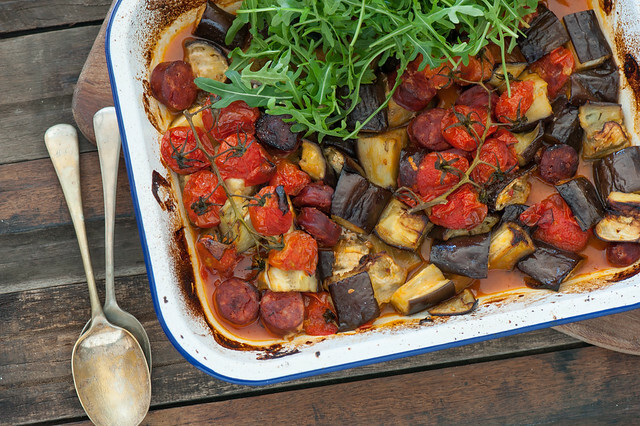 Toss eggplant, tomato and chorizo in a large baking tray. Drizzle with a good glug of olive oil and season with salt. 3. Roast for 45 minutes. Stir and cook longer if needed. You want the eggplant to be really soft. 4. Divide between two bowls and serve with spinach / salad and mayo on the side. vegetarian – replace chorizo with extra veg such as sliced zucchini or an extra eggplant (aubergine). Consider serving with some roast nuts or a poached egg for extra protein. no mayo / egg-free – replace Mayo with a dollop of soft cheese like labneh or goats cheese. Hummus will also be lovely as will natural yoghurt. other veg – feel free to add diced onion, sliced zucchini, chopped capsicum (bell peppers) and / or whole cloves of garlic. not hot / small person-friendly – use mild chorizo or non-spicy sausages. You can bake the sausages whole if it’s easier than slicing (or crumble the meat out of the casings). carb-lovers – toss in cooked pasta before serving or serve on a bed of cooked quinoa or brown rice. Also great with crusty bread for mopping up the juices! herby – toss in torn basil or parsley before serving. 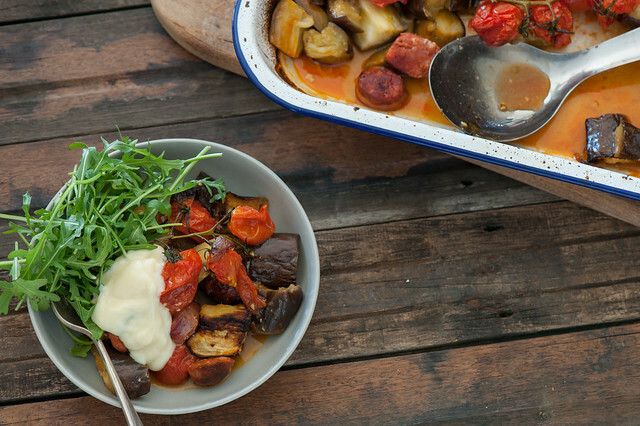 Cook eggplant, chorizo and tomato as per the recipe but don’t add the salad or mayo. Refrigerate for up to 2 weeks or freeze. To serve wam in the oven or a frying pan and serve with spinach / salad and mayo. I know. The problem with the ‘butter knife’ technique is that it bends the lid so it won’t seal again completely. So don’t use it if you’re planning on reusing your jars for anywhere you need an air tight seal like preserves or jam. pps. 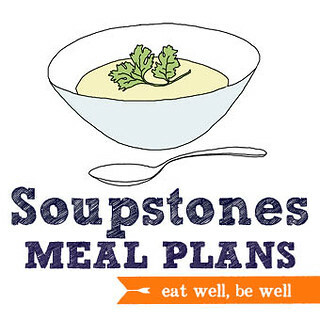 Tired of deciding what to cook? I usually just wrap a rubberband around the lid, or take any rubber (or latex) gloves to get some grip, most of the time it works great. I tried the knofe method a couple of times, but I was afraid to damage the knife. I bang the side of the lid attached to the jar against the wooden chopping board until it pops. Works every time. I tap all around the edge of the top with a knife and likewise works like a charm every time! Another technique that works well for opening vacuum-sealed jars is to tap the edge of the lid on your counter (or bench) all the way around. That usually loosens it up nicely. For things like honey or molasses jars, I try to keep the rim clean, because that goes a long way to keeping the lids from sticking. I’ll probably be trying a version of today’s recipe because your Magic Sausage Supper is one of our all-time favorites. And I try and keep rims clean too but not everyone in the house does as well! A better way to break the vacuum seal is to just hit the bottom of the jar with your hand a couple of times. You need to hit it fairly hard, but not so hard you hurt yourself. My grandma has been doing this for years and taught me the trick. This way you don’t damage the lid, your knife, or risk cutting yourself. I was a professional weekend bartender for the better part of two decades. When we would drain one bottle, we had to open the back-up, switch the speed-pour and continue mixing the drink before the customer knew what was happening. Karen’s grandma had the right idea. The trick is to hold the bottle or jar securely in one hand, tip it over, when the contents shift to contact the lid or cap … hit the bottom at the same time. Once.